The central part of any recording studio is the sound mixer and I will tell you about different mixers that can be used in a home studio setup. A sound mixer is a piece of hardware that allows many cable connections so other audio equipment such as microphones and instruments can be connected to it. A mixer is usually used to send the sound from all the connected equipment to one or more output sources such as speakers or a recording system. Mixers can be broken up into three main categories including analogue mixers, digital mixers and virtual computer based mixers. Each type of mixer has strengths over the other but the type of mixer you use will depend on your recording requirements and budget. An analogue mixer is the oldest type of mixer and they have been used in commercial studios and for live band mixing for many years. Analogue mixers are still a popular choice for home studios because they are cheaper and some people prefer the raw sound of an analogue signal. Analogue mixers require you to connect the mixer to the recording device using audio cables similar to the cables used for a home stereo system. A computer sound card or hard disk recorder will be required to have a mic or line input if you are connecting an analogue mixer to them. An analogue mixer will not sync with other devices or allow you to controls other devices but they do usually have auxiliary options to connect external effect processors like reverb and delay which can be added to your mix while recording. These are a popular choice for a home recording studio mixer because of the low cost for an entry level setup. Digital mixers use an electronic signal to process sound sent to it and send it out in a digital format that can be understood by computers and other digital recording hardware. 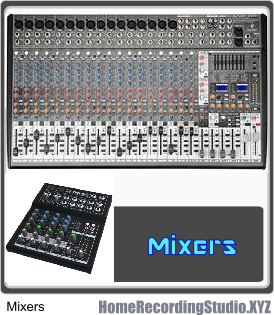 A digital mixer will be able to sync to computer based recording software so changes made on the mixer will also change on the computer and often it works both ways. This gives you more control over the mix and also allows the mixer to be used as a way to send the sound into the recorder while mixing in on the computer or other digital device. A digital mixer will often have a USB connection which is a standard way to send data between electronic devices. Electric mixers alter the analogue sound sent from an instrument and convert it to a digital signal which is why they are called digital mixers. Computer based mixers are usually part of a home recording software package. The mixer is usually a panel, window or tab that can be opened when you are ready to mix your recording. If you are only using this to mix your sound you will still need to use an Audio Interface to connect the instruments to the computer. HomeRecordingStudio.xyz is your source to the world of home recording studio and producing music and sound at home.